The Paleoamerican Odyssey conference held in Santa Fe last October featured a series of talks by researches from around the world focusing on the search for the First Americans. The Minnesota Office of the State Archaeologist will host a lecture at the Historic Fort Snelling visitor center on Thursday evening March 20, 2014 beginning at 6:30 pm where two of the conference participants will summarizes the conference highlights. The event is free and open to the public. 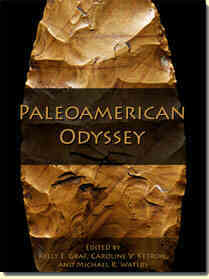 “Adventures in Santa Fe: The Paleoamerican Odyssey Conference” by Susan C. Mulholland and Stephen L. Mulholland. The 37 papers presented during the main sessions were complemented by concurrent poster sessions, workshops, papers in the evening, and, most exciting, a display of artifacts from many of the pre-Clovis sites as well as Clovis, Folsom, and other Early Paleoindian sites. This presentation will focus on the displays of pre-Clovis sites, photographed through the cases (sorry about that) with commentary derived from the presented papers, posters, and associated published articles. There will be time for questions and answers following the presentation.